Refering to our last lesson on law and visual narrative and the connection between political power and art I would like to talk about FRIDA KAHLO. Frida Kahlo (1907-1954) was one of the greatest Mexican surrealistic paintress, often called “rebel artist”. She had success for her particular self-portrait technique and also for several tragic experiences during her life. She became popular in Mexico because of her revolutionary ideas and political activity, supported also by her husband Diego Rivera, a communist Mexican artist. She joined the young Communist league and the Mexican Communist Party; she always wanted to express political contents in her paintings. She contributed in a project for the portrait of Lenin and she helped Trotsky during his exile in Mexico. She was a symbol of Communist Revolution in Mexico. In one of her last work, “Marxism will give healt to ill people”, Frida expressed a clear and unmistakable sense of love and admiration for the Communist party. She dedicated her life to paint with the intent of making her art useful for the Mexican Revolution and for the Communist movement. She declared it publically several times. At the end of her life she blamed herself thinking that she wasn’t able to make her art available to Communist Party. She didn’t agree with the imperialistic ideology of her time, so she tried to fight it expressing national identity feelings in her works. So we can see clearly Frida’s communist faith in a lot of her paintings, especially in the “Self-portrait with Stalin”. Nowadays finding art used as a form of protest to the power is more common in the web rather than in the city. Probably it is more efficient, more impressive, faster. Jeff Hong, an animation artist of New York, has assembled real pictures with the animations of Disney’s characteres. I attach the link so that everybody here can have a look (http://disneyunhappilyeverafter.tumblr.com); the pictures are very communicative and they are a sort of provocation against society and the governament that is not caring about some important social and enviromental problems. The name of the work is “Unhappily ever after” and it deals with the stories of the disney’s characters living in the real world. A very similar use of the manipolation of pictures and famous paintings or icons, has been done after the Brussels’s attack against one of our politician: Matteo Salvini. He has always been critized for his absence in the european Parliament and then, he posted a picture of him, talking at the phone, immediatly after the attack in Brussels. He has been accused to use the social media and the dramatic event, as a tool to get more consents and political approvation. “#matteosalvinieverywhere” spread very fast on Twitter and so someone created sarcastic images, with photoshop, overlying his figure to famous scenaries (such as for example the famouse painting of Garibaldi). Thinking about the use of art as a tool for fighting the power, it came to my mind also the Russian orchestra that has played in the Palmyra ruins , destroyed by ISIS attacks, in Syria, some days ago. I know that is not a figurative art, but it is maybe one of the strongest example of how the best answer to violence, is the culture. Moreover some months ago, our Health’s Minister B. Lorenzin,announced a very strict anti-smoking law: “It will not longer smoke in public parks, on beaches, in stadiums, in the car with the children on board, but even in the TV series or movies” it said. Against this drastic legislation, a lot of italian movie directors (such as for example Gabriele Salvatores, Muccino, M. Martone, Paolo Sorrentino and Paolo Virzi), claimed the use of tobacco in their scenes films as an artistic way of expression. Codacons replied that is indisputable as the tobacco companies have invested mainly on films and television to publicize tobacco to conquer the young, with damage to health, environment and national economy. Also I wanted to give this example to stress how art could be used by politic and economy and how artists now claim the freedom of expression, even against law. 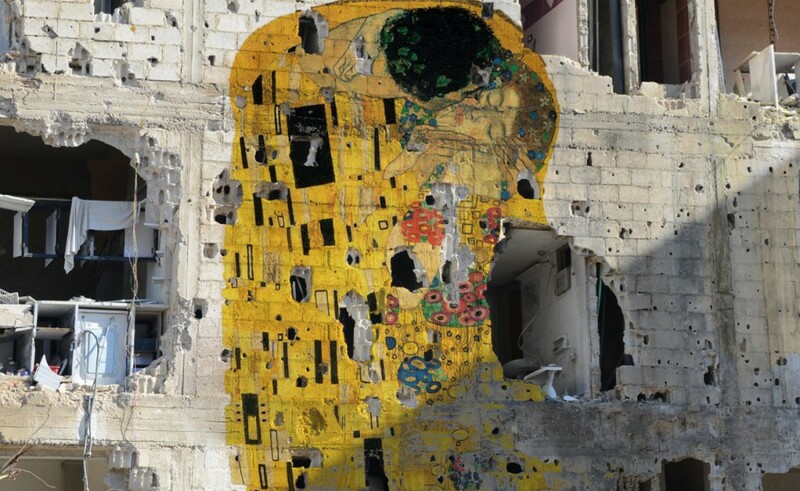 A well known name in the area of ‘charged’ artistic paintings Banksy #withSyria, is an excellent example of a modern work used to relay a narrative. One of the most striking paintings is the one showing a child reaching for a balloon shaped like a heart. 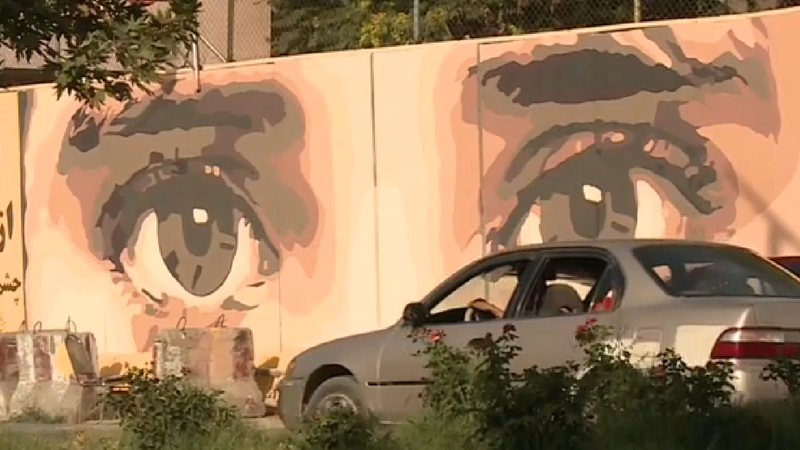 The painting is demonstrating the narrative of an event in a Syrian town, where 15 children got arrested and tortured for writing graffiti with a clear democratic message. Protests that were organized afterwards induced violent clashes which grew into a full-blown civil war, which resulted with 9.3 million people being forcefully removed from their homes. Banksys work is an excellent capture of this narrative as well demonstrating the good nature that street art can be used for, instead of simple graffiti. An artist has got a powerful weapon in his hands, he knows how much attention can be caught through his works; art doesn’t care about social level or literacy rate, art is understandable by everyone. Furthermore nowadays, since people don’t have time (or the will) to stop and read newspaper’s long articles about the last bombing in Medium Easter or they listen to the newscast holding the fork in one hand and the Iphone in the other one, an original artistic work is the most direct tool to communicate. But, in the 21st century a simple painting, even if it shows a very strong vision of the reality, can unlikely manage to stun people and to have a worldwide spread; thus, some artists have been trying to get attention not bringing reality inside their works but, on the contrary, adapting art to what they are surrounded by. And what they find it’s often the result of war and corruption. An artist has got a powerful weapon in his hands, he knows how much attention can be caught through his works; art doesn’t care about social level or literacy rate, art is understandable by everyone. Furthermore nowadays, since people don’t have time (or the will) to stop and read newspaper’s long articles about the last bombing in Medium Easter or they listen to the newscast, holding the fork in one hand and the Iphone in the other one, an original artistic work is the most direct tool to communicate. But, in the 21st century a simple painting, even if it shows a very strong vision of the reality, can unlikely manage to stun people and to have a worldwide spread; thus, some artists have been trying to get attention not bringing reality inside their works but, on the contrary, adapting art to what they are surrounded by. And what they find it’s often the result of war and corruption. In my opinion the art that has an immediate connection with law and political power (especially in a form of protest against it) is the graffiti art. This is a kind of street art characterized by the art as the picture in itself and the art as the performance of the artist (the drawing done on a wall of a public space) which in itself is a form of message, or better a protest, sent to society. So, street artists do often their works against rules of law, but sometimes they are also called from public figures to do a work in a legal way. This is for example the case of Keith Haring, probably the most important american graffiti artist of 80’s. In 1986 Keith Haring was called from Mauermuseum to paint a part of the Berlin Wall. He accepted the job and went to Berlin, in the ovest side. He worked to his picture one whole day, and his presence had an important political and media impact, in first for his US citizenship and second because to complete his works he had to climb over the wall, where the authorities of the East side could arrested him. In the end he managed to finish the murals also in the other side because it was judged as not offensive toward the DDR. The work represented a human chain, painted with three colors: yellow, black and red, the German flag colors, with an undoubted message of peace. Keith Haring said more and more times that this message should be interpreted as an universal message of peace, and not as an insult, because he hoped to see a united Germany. Three years later the wall was razed, so the purpose of the drawing was reached, but the murals was also destroyed with the wall. Another kind of figurative art linked with political power in my opinion could be a Donald Duck cartoon called “der furher face”. It is a 1943 American animated propaganda short film produced by Walt Disney. The cartoon was made in an effort to sell American war bonds during the second World War. In the cartoon Donald Duck has a nightmare in which he works at a factory in the Nazi Germany. I put here a YouTube link where you can see the funny short movie in english with italian subtitles. An artist has got a powerful weapon in his hands, he knows how much attention can be caught through his works; art doesn’t care about social level or literacy rate, art is understandable by everyone. Furthermore nowadays, since people don’t have time (or the will) to stop and read newspaper’s long articles about the last bombing in Medium Easter or they listen to the newscast, holding the fork in one hand and the Iphone in the other one, an original artistic work is the most direct tool to communicate.But, in the 21st century a simple painting, even if it shows a very strong vision of the reality, can unlikely manage to stun people and to have a worldwide spread; thus, some artists have been trying to get attention not bringing reality inside their works but, on the contrary, adapting art to what they are surrounded by. And what they find it’s often the result of war and corruption. We have learnt in the last lessons that at first the figurative arts were much closed to the political power. We can date back this experience to Maecenas, then to the Popes and the Kings, who committed many works of art to the biggest artists of the world. We have seen also that this interconnection became much less evident during the 19th and 20th century, where the figure of the artist, with his thoughts and his techniques, was very much distant to the will of the monarch. In reality (and hopefully!) not much of all of this was actually done, just a couple of, again, private and indoors exhibitions, whereas the painting of public building never took place. On the other hand, what really made inroads were the propaganda cartoons. For example, when Mussolini decided to intervene alongside the German ally against the Western powers, L’Arena, a national daily newspaper, both in the first and third page, published very hard articles against the “plutocratic powers”, as the Allies were called in Italy, accompanied by cartoons that target Churchill, Roosevelt and Stalin. When in class we talked about the connection between art and the political power, I immediately thought to the wall dividing Israel and Palestine. I’ve been there and while guards were cheking my passport, I was surprised by the huge number of graffiti on the wall. Expecially my attention was captured by the drawing of a dove with a bulletproof vest and with the viewfinder pointed at the heart. It’s a provocative version of the most popular symbol of the peace, by Banksy. He is a particular artist because of his strange decision to remain anonymous, but we can find his works all over the world: from the famous “Rats” he did in London, Paris and New York to the reinterpretation of the “Extasy of blessed Ludovica Albertoni” by Bernini that he did in Naples, portrayng her with chips and a sandwich in her hands, as a symbol of Consumerism. So thanks to him and to street-artists in general, art can express desire for freedom and social and political protest. I would like to focus attention of one of the most pressing issues of politics and society today, tragic and dramatic urgency, that is immigration. We all know what the problem is and we also know what about the varied landscape of solution proposed by the various political fronts. So, avoiding to immerse myself in a deepened discussion about these policies and about the considerable difficulties the national governments, in particular the Italian too, meet in the management of migration flows, regarding both the arrival and the permanence as the subsequent possible compulsory expatriation of these individuals, I want to refer to a very interesting Sicilian artist, Giovanni Iudice, who, among other works, is particular devoted to this theme. Iudice (Gela, 1970) is a realist artist, a very strong personality, acting as a committed intellectual, very active on social networks, in whom intense is the desire to denounce social and cultural discomforts. “We need to break the mechanisms that immobilize us. Art can be a pretty strike force against power. Especially if the policy tends to invade every field, even the culture and art, through petty and short-sighted management. This policy has the habit of treating also what is not for it as the phenomenon of creativity”. He affirms. But also the enthusiasm of this civilly committed artist, though not crushed, is mitigated by the sense of reality: “Here who think the most is destined to exile. But those who remain must try to overturn this assumption. Here is the most important and beautiful sketch that art in Sicily can give”. His cycle of works about clandestine proposes a reflection on the human dimension and immigrants existence through a realistic language and from a point of view always opposite to the constituted power. There are several paintings in which he represents Sicily as a landing place of a multitude of men and women looking for hope, the atrocious expressions of those who fight for freedom, who believe it is necessary to escape their degradation to achieve salvation. At the center of the image, above a carpet of death, disease, degradation and ridiculous aids, stands the only positive message: a woman who raises a child. The child holds a green flag, the hope of a new life, a better future. 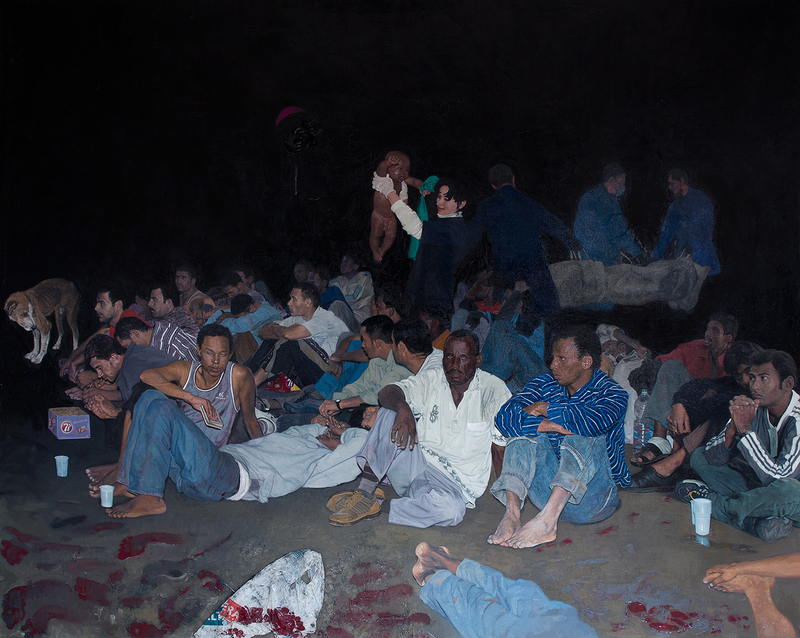 “This picture is an emblematic piece of art, it’s a complaint to insufficient democracy and inequality that concerns human beings on a distance of one side to the other side.” Affirmed Vittorio Sgarbi who presented the painting at the exhibition “Artisti di Sicilia”. “The Fifth State of our time that represents a sea denied, a black sky of a night without life and without love”. How much humanity we’re all missing in our society? And How much human is the power that rules us? I would like to focus the attention to the political use of figurative art. The first image that comes in my mind is a famous poster: ‘’Uncle Sam’’ with the sentence ‘’I want you’’ drawn by James Montgomery Flagg. He represents the personification of United States (in fact the initials of his name are U.S) who are inviting people to join the USA army during the first world war. This image is originally used as a propaganda of the political power to instill in the people a sense of patriotism and in this way encourage all Americans to help with the war effort. Some years ago, during the election campaign, this image is used in a satirical way, in fact the face of Uncle Sam (that is a self-portrait of the drawer) is replaced by a photo of an Italian politician, Silvio Berlusconi. (http://www.unita.it/italia/vent-anni-di-occupazione-tv-1.522129). Another example of using figurative art for propaganda is the poster ‘’We can do it’’ produced by J.Howard Miller. It represents a woman who is a young factory worker, and it was painted for Westinghouse Electric and Manufacturing Company in 1943. During the second world war it was used to recruits workers in factories especially women. At the beginning of ‘80s this image was used to promote feminist movements, and nowadays it is used as an icon of this movement. (http://www.theatlantic.com/entertainment/archive/2015/04/the-many-faces-of-rosie-the-riveter/391364/). In former times artistic expression had been linked in a particular relationship to the politic powers; in anti democratic societies also today the free and liberal expression in art or literature is not permitted. There is only space is a private sphere and art is not considered to be part of secret cliques. However through centuries art was used to demonstrate power and sovereignty. Thousands of artworks around the world had been produced to glorify the powerfulness of politic systems. In the past all types of art had been dependent in a strong from the goodwill of a certain person acting in the field of politics. Nowadays art is used to express power too, but also to send out signals to show the injustice of a system. The political movements of the 20th century had an enormous influence to the evolution of art and their freedom. In the class “Law and Architecture” the impact of symbols connected with a system, in that case it was the political system was analysed. As a result it was considered that modern democratic societies try to reduce the value of a certain symbol relating to a system, in contrast to fascistic or non democratic States in the past. Those all have had their symbols and their influence to art; at least these political systems wanted to determine what art is and what not. Modern artists interacting with this issue are Banksy, an English street artist, who sprayed graffiti all over the world. Although he is belonging to the most famous artists of this scene he hides his person from the public, and tries to stay in anonymity. Other examples for artist well known for their strong ideas referring to that special topic are for example Christo and Jeanne-Claude. They wrapped the “Reichstagsgebäude” at Berlin with 100000 square meters of an aluminium layer. From the 24th June till the 7th of July of the year 1995 the “Reichtstag “was covered with this blanket. The intention of both was to show an artwork that is not there for a long time- the temporal character of art should be underlined with this idea. The couple also clarified that this special artwork is a thing like a RES EXTRA COMMERTIUM; nobody could by the whole wrapped “Reichtstag”. The artistic expression is in every time a particular one, the art scene has to set a new accent in its field. Otherwise living art would die and it would lose its connection to all contemporary issues. Art has to deal with the struggles of public life and also to criticise political power. I have chosen as an referable element the Greek’s figurative art during the ancient Greek. So, the connection I found during the ancient Greek century, between the political power in those ages and the Greek’s figurative art, is the representation of Ares, god of the war, representing the fighting spirit. Omero, an ancient Greek poet writes in his ‘Iliad’ that Ares was the opposite of Athena, she was also the goodness of war but she fought with strategic intellect and tactic ability not with wars, as the practical act as Ares did. Omero writes also that during the Troy’s war Ares fought with the Trojans and Athena with the Greek people and during the war a greek man called Diomede injured Ares and after this, when Ares got fighting one by one with Athena, her knocked Ares out with a big rock. ARES BORGHESE DI ALCAMENE (https://studiahumanitatispaideia.files.wordpress.com/2014/07/statua-del-cosiddetto-c2abares-borghesec2bb-copia-romana-in-marmo-del-i-ii-secolo-d-c-da-un-originale-di-alcamene-musc3a9e-du-louvre.jpg) and the second one is ARES LUDOVISI (https://www.google.it/url?sa=i&rct=j&q=&esrc=s&source=images&cd=&cad=rja&uact=8&ved=0ahUKEwj4ws_N-uHMAhWCuhQKHUqUBBwQjRwIBw&url=https%3A%2F%2Fen.wikipedia.org%2Fwiki%2FLudovisi_Ares&psig=AFQjCNFQzo6ejdyPp8pHzkiHusqy-Aaxgw&ust=1463603589680377 ). Ares changes in the representations because sometimes he looks like a mature, aged man, dressed and with the beard as in the archaic art and other times, instead, he figures as a young man, naked and without beard as in the classical and hellenistic art. But, in both times, he always has a big helmet, a lace and a shield. There is a different in the statue because in one he is standing and in the other he is seating. The first statue is located in my home town, in Villa Adriana ,Tivoli, 30 km from Rome but nowadays it is exhibited in Louvre Paris and in this statue he is standing and looks like as the second description I made, while, in the second one, instead, Ares is seating and he looks made out as the first description I wrote ,before, and this one is exhibited in the National Museum of Rome. In the lesson that we had on Friday 6/05 the professor had shown the path of art and politics who were always very connected, because the works were commissioned and financed directly by political power, until last century when the art world has gained its independence. There are also contemporary artists who draw inspiration from the political world and especially from the financial sector. An example is the Italian artist Maurizio Cattelan who through his works provokes and rebels against the system of strict rules which underlie our life in contemporary society. A significant work, that represents this thought, is “lavorare è un brutto mestiere” of 1993. Another provocative work is “Charlie don’t Surf” of 1997 which sums up his rejection of an ethics of sacrifice, which is also reflected in the Christian world, before in the school and then in the work: Charlie is attached to the desk of the school with pencils skewered in the hands, thus making a clear reference to the image of the crucifixion. A work by Cattelan, fundamental to the topic we are dealing with, is the sculpture “la nona ora” of 1999 that depicts John Paul II knocked down to the ground under the weight of an enormous meteorite and surrounded by broken glass. Regarding the protest towards the financial sector we must quote the sculpture L.O.V.E. ( by Cattelan), we had also talked about this work in the class, and for what it stands for and the location where it was positioned needs no further explanation! Esteban Del Valle’s inter-disciplinary work is steeped with narrative references that explore political themes and social issues. His drawings and murals make particularly strong socio-political statements. They’re presented in bold forms that reflect the energy of the streets, the history of painting, the performative aspects of political campaigns and revolutionary actions. Del Valle also works with Groundswell teaching mural painting to New York City youth. With these young artists, Del Valle addresses social issues that affect their community and daily lives such as mass incarceration (the prison industrial complex), police brutality, broken windows; and rising above these crises to create a better future. Art and political power have both the same aim : go directly and catch the attention of the public. For this reason, art and politics have a strong link that is very different in different periods. Art was an instrument in the hands of politic power, used to promote a war, to show a victory, but also to influence the choices of the public . For instance, in the 80s,Japanese economy was in a boom and USA started a propaganda to contrast the spread of Japanese goods into U. S. markets. USA used films, cartoons, books and posters to resist at the “Japanese attack”. Art was also used to go against financial and politic power. In this sense, one of the most representative work is L.O.V.E. ( Libertà, Odio, Vendetta, Eternità) by Maurizio Cattelan . This work is a marble sculpture and it represents a middle finger sticking straight up from an otherwise fingerless hand pointing away from Borsa Italiana. That’s a clear symbol of protest against Fascism and financial power. I want to talk about Picasso and his Guernica. Probably Picasso’s most famous work, Guernica is also his most powerful political statement. In the afternoon of the 26th of April 1937, German planes began bombing the town of Guernica, trying out some of their new weaponry and military tactics. Germany, under the direction of Adolf Hitler, had supported the Nationalist side of the Spanish Civil War with weapons and other material supplies, and so in repayment, General Francisco Franco allowed them to bomb Guernica. The bombing attack was meant to intimidate the resistance as there seemed to be no clear target. There was in fact a factory in the town that manufactured military supplies although this building remained unscathed; so the bombing was not tactical. Reports differ depending on which side people fought on. However, according to the Republicans, although most of the men from Guernica were away fighting in the Spanish Civil War, which left women and children in the town at the time of the attack. Some critics warn against trusting the polital message in Guernica. For instance the rampaging bull, a major motif of destruction here, has previouse figured, whether as a bull or Minotaur, as Picasso’ ego. However, in this instance the bull probably represents the onslaught of Fascism. Picasso said it meant brutality and darkness; he also stated that the horse represented the people of Guernica. Art, political power and law are often strictly connected. Sometimes the author puts his soul to connect one or more of them, other times it is casual, it just happens. But it happens because of the surrounding environment. What stands and goes around the author is what characterizes him the most. This happens in several fields, such as movies, music, street art, paintings and writs, such as books or even short stories. Just to summon a couple of examples, we can listen to Mosh, a song by Eminem, from the album Encore. It is a song, but a political one. The title means “To march”, it is just the transposition of the pronounce. The will of the author was to communicate his grudge against Bush and “his” wars for oil. Eminem says laws have been violated, he says to regain the power which belongs to the mass. I repeat: this is a song, but it sounds like a political speech, yet. In this song politics, laws and art merge to create something new, to say something. Another example can be the movie “Cose Da Pazzi” by Vincenzo Salemme. He asks the State to be considered an invalid, claiming his refund. Why? Is he an invalid? No, he’s not, but he believed in Communism, but Communism failed, leaving him still believing in values and virtues which fell apart. He compares Communism to religion itself, asking the employer of the INPS if a person who believed in a no more actual idea was able to live among the others. He askes “What would you do if, for instance, we could be sure nothing exists after our life, nothing. Would you still respect the commandments? Or would you kill, instead, and steal? It is just a case this time MY beliefs fell apart, and not your ones. I cannot longer live here, with my ideas. My idea fell apart when Communism fell apart. And how would you consider a man who cannot live anymore among other?”, and “An invalid”, answers the employer. “That’s the point, and as an invalid, I deserve a refund”. There are many links between the three: political power, art and law. We see it everyday, with movies, books, even music. I remember a movie, Goodbye Lenin, for instance, and a book, Animal Farm, by George Orwell. These are two different kind of art, the first one is a movie, something you watch by standing on a couch. It goes on and on and you just have to understand, see what happened and “take place” in Berlin, when the Wall fell, and a woman, after she has been in a coma for 8 months, is preserved by her son, who tries to let her live in a “fake” world, inside a room where things never changed. The other one is a book, something you can read on your couch as well, but you can imagine, through the allegory, a lot. Every character is another character, and, just alike Esopus and Phaedrus, they are represented in animal shapes. And so Old Major can be both Marx or Lenin, Napoleon is Stalin and Snowball the pig is Trotsky. This is how art, law and political forces tie. Everything is art, and art can absorb near ambience, which can be both law or political forces, which contribute creating the laws. It is a great round: political forces can create the laws, laws can influence the ambience and reality, reality can be expressed through art, then art can make this cycle restart.